An egg hidden under the tree's branches hatched after the holiday season. VIRGINIA, USA — (ABC NEWS) -- A Virginia veterinarian is experiencing a nightmare after Christmas as dozens of unwanted critters are roaming her home. 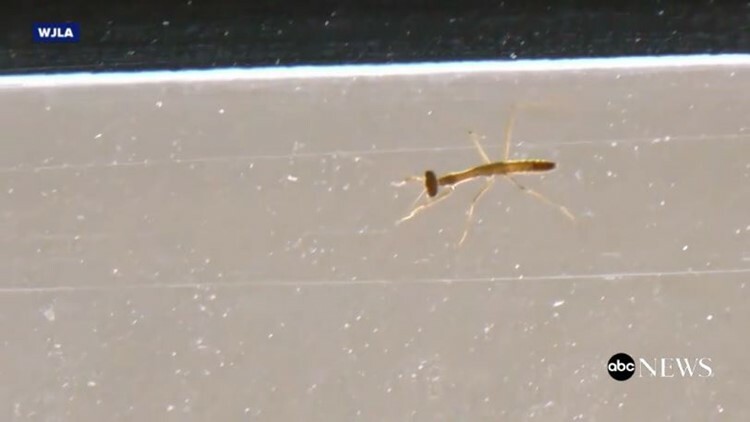 More than 100 praying mantises hatched from an egg case hidden under the branches of the Christmas tree Springfield resident Molly Kreuze bought for the holiday season, ABC Washington D.C. affiliate WJLA reported. The bugs are moving freely through the house, "crawling on the walls, crawling on the ceilings," Kreuze told the station, adding that they gravitate toward light. Video taken by WJLA showed the insects hanging from the ceiling and crawling on the windows. When asked whether she's seen any praying mantises in the bedroom, Kreuze said, "I don't want to think about that. It's possible, but I don't want to know." Instead of vacuuming them up, Kreuze has been using an envelope and shoe box to store the mantises. Kreuze has been feeding them fruit flies and is "hoping to re-gift them," she said. "In my googling, I discovered people really like praying mantises," she said. "They are useful, they eat other bugs, people use them for organic gardening." While Kreuze and her family don't plan on killing the bugs, they don't plan on keeping them either. "I hope to find them a home," she said. "I don't want them." However, the mantises may have put Kreuze off real Christmas trees forever. Next year, she plans on buying a fake one, she told the local station. For more news from ABC click here.